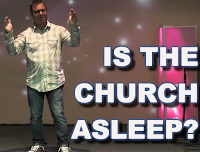 Home Weekly Video Is the Church Asleep? While inside a boat with the disciples, Jesus was asleep during the storm. The disciples became frightened because they believed the boat would sink. The came to Jesus begging him to wake up. He got up and calmed the wind and the waves with His voice. Just before Jesus went to the cross, He took the disciples to Gethsemane to pray. He knew He was going to face a painful death. He asked the disciples to pray, yet the fell asleep. Too often, the church does not take the request of Jesus seriously. Often, we fall asleep on the Job. However, when our own lives are at stake, we become very anxious for Jesus to respond to our request. This sermon is meant to motivate us to trust in Christ and further His mission.